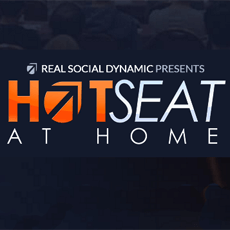 “The Hot Seat at Home” is based on RSD’s Hot Seat teleconference program, recording extensive infield footage, and helping thousands of men achieve results with women. The program consists of taking the most informative clips of pickups and breaking them down, analyzing them, and extracting the core principles and techniques. This is followed by exercises to reinforce the core concepts you learn in the videos. The at home program parallels this experience. It is designed as an at-home experience including the most critical mind-bending concepts. 1. Infield Footage Breakdowns: What good game actually looks like that is broken down, explained, and implanted into your subconscious mind. 2. Interactive Exercises: To push, challenge, and transform you by internalizing the core principles of game. 3. Compelling Challenges: To compel you to take action, move you out of your comfort zone, and make you realize your full potential. 4. Bootcamp Footage Breakdowns: To revolutionize what is considered to be ‘good game’. Includes pickups, openers, and game demonstrations. 5. The Hot Seat Tribe: A supportive community of like-minded guys, complete with weekly missions, Facebook Group, Phone App, and Invitation-Only Teleconferences. - Blueprint for approaching, escalating, closing, etc. "Perfect if you're willing to work HARD"
First of all, I'm talking about the core edition (no mastermind). RSD need no presentation. It is one of the biggest seduction company on the market, so I will go directly to the heart of the review. THE GOOD : Everything is finally done. I was one of the first people doing this program, and some videos still needed to be done. Now everything it is online. There are LOT of hours of videos, around 4-6 HOURS of INFIELD, almost 4 HOURS of core explanation, and a 90 minutes recap of the advanced principles. Plus hours of video bonuses. There are also around 10 missions (talking about the no-mastermind-edition) to do on the field that will improve your game, making you realize interaction-changing stuff. In my opinion this program is the core from where every Pick Up Artist must begin its journey. THE BAD : Tyler is not anymore on the telegram chat. I had the honor to chat with him, but actually it is very rare that he will join us on the chat. Still there are lot of active dude in here, even if at the beginning of all, this part of the program was waaaay more active. Same for the facebook secret group. To conclude this review : In my opinion, the starting point for every Pick Up dude who wants to become a natural. You will return after years seeing those videos, learning and noticing more concept, getting more value from here. I usually check again everything every six monthsa year, getting always a lot, and reminding myself what I want my game to be look like. "Few complaints, bad customer service." I think my only real complaint so far is the customer service and the bonuses are atrocious. I reached out more than 5 times about the telegram group, and the facebook group. When I reached out about the day of Vegas Immersion, they told me I couldn't get in unless I paid for a full week of Immersion, so that bothered me. I just think they're not devoting enough resources to follow up, and maybe are devoting all their resources to marketing and getting new customers to point of purchase.